V. M. Jenkins’s Newly Released “On That Day” Is a Hilarious Story of a Spirited Young Girl New to Homeschooling Who Attends Her Brother’s Bible Study With Mixed Results. “On That Day” from Christian Faith Publishing author V. M. Jenkins is a charming novel following sixteen-year-old Haven Jennings, a witty and worldly girl who warily enters homeschooling after a life in the public school system—until one day, attending her gifted brother Delbert’s early morning Bible study, she meets the new boy Aaron and attempts to strike up a friendship with him, not realizing just yet what God has in store. 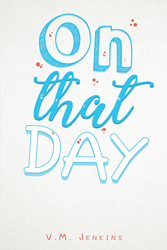 “On That Day”: a lively story of a homeschooled girl who attends a Bible study full of colorful characters. “On That Day” is the creation of published author V. M. Jenkins, a former special education teacher and proponent of homeschooling who lives in Fort Smith, Arkansas, with her husband and three children. Jenkins sets the mood perfectly for her character’s introduction: “The obnoxious fairy ding went off on my phone to let me know that the time was now around seven-thirty in the morning. My Wednesday friend Kate sent her usual good morning message to me, in nature-loving form. The text read, ‘Get up and enjoy the world, because the roses are waiting!’ I turned over face down on my pillow, grabbed its sides, and pulled them up on my ears. It didn’t help, because the guilt of the text was driving me insane. Published by Christian Faith Publishing, V. M. Jenkins’s new book is a vastly entertaining read that brings the reader right smack into Haven’s unique homeschooling world and the memorable characters she deals with on a daily basis. View a synopsis of “On That Day” on YouTube. Consumers can purchase “On That Day” at traditional brick & mortar bookstores, or online at Amazon.com, Apple iTunes store, or Barnes and Noble. For additional information or inquiries about “On That Day”, contact the Christian Faith Publishing media department at 866-554-0919.